Our custom Wall Graphics and Vinyl Wall Wraps are perfect for both temporary and permanent signage displays. They can be used to promote the opening of a new business, to comply with building codes and regulations during constriction, and to sell advertising space in malls and office buildings. What is a construction barricade wrap? Opening dates and remodel information. Contracting company information and code compliance information. Why should you use one of our Custom Barricade Wall Wraps? Because nothing builds anticipation for a new store’s grand opening like a full size promotional wall wrap. Not only do these graphic wraps generate excitement, but they also conceal construction work before the big opening. 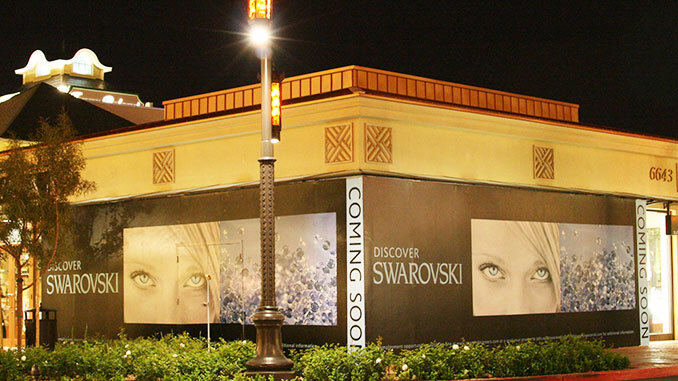 Construction wall graphics can build excitement, awareness, and buzz before your store ever opens. Wall graphics can turn unsightly construction areas into branded displays that will conceal the work from the public. A mall barricade graphic can turn an empty storefront into a giant billboard while the space is being promoted to new tenants. We also offer installation services to ad agencies, and other printing companies. Would you like more information on our wall wraps?